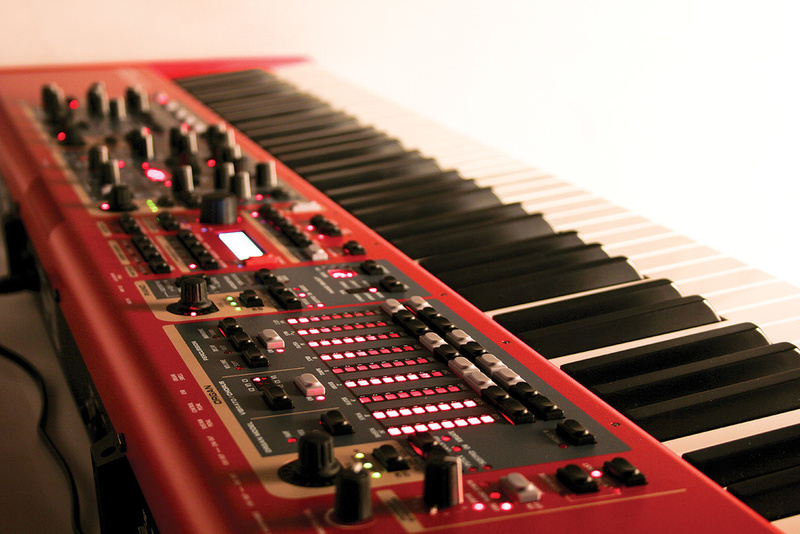 Synth, organ, piano: the Nord Stage 2 does it all, and now even lets you load and play your own samples. Is this the best Stage yet? Perhaps one of the least expected developments in synthesizer technology over the past decade has been the re-emergence of the 'stage' keyboard. Back in the 1970s, we called them 'multi-keyboards' and they combined electronic piano presets that sounded nothing like pianos, strings presets that sounded vaguely like orchestral strings, and brass presets that occasionally sounded similar to brass. Later, the brass sections evolved into fledgling polysynths, before the species as a whole was swept away by the emergence of affordable polysynths and workstations that did everything that they could do, and much more. Nevertheless, the concept never died, and when piano and organ emulations became good enough to fool many of the people most of the time, the genus was reborn. For Clavia, this happened in 2001 when the company announced the Nord Electro. I was not a fan, but matters later took a turn for the better with the release of the Nord Stage, and then the Nord Stage EX, which I reviewed for Performing Musician in 2009 (www.performing-musician.com/pm/apr09/articles/nordstageex88.htm). Today, the EX has evolved still further into the Stage 2. This offers a wider range of piano sounds than before (some pre-loaded, others supplied on the accompanying piano library DVD), three organ models, and a synthesizer that combines virtual analogue synthesis, basic FM synthesis, PCM-based synthesis and, for the first time, sample-based synthesis that can use your own samples as well as the libraries provided by Clavia. Three models are available: the HA88 (reviewed here) and 76-note HA76 (£3299$3999), which share the same weighted hammer-action keyboard, and the 73-note SW73 (£2999$3599), which has a semi-weighted, organ-profile keyboard. The Stage 2 retains the distinctive red livery and chunky construction that has become Clavia's trademark, and very nice it is too. With the pitch-bend and mod wheel controls behind rather than beside the keys, it's only three inches wider than the keybed itself, and it's surprisingly shallow from front to rear, all of which makes the HA88 pleasantly manageable. Furthermore, at less than 20kg it's not unwieldy. Brace yourselves, knob fans: the control panel is festooned knobs, buttons and LEDs. From the left we have the Organ and Piano sections, global controls, the Synth section and the Effects and Compressor. You can use the included Sound Manager software to replace the pianos and related instruments installed at the factory but, before doing so, I decided to check out the pre-loaded instruments. As soon as I selected the first of these, something leapt out at me — the patch name. Grand Imperial? That's a Bösendorfer, whereas the EX only featured a Steinway Model D and a Yamaha C7 in its original grand-piano sound set. The Grand Imperial is my favourite piano, so it was with some trepidation that I started to play... Was I disappointed? Not a bit! The sampling is even, the velocity transitions are smooth, the string resonance is lifelike, and the new Long Release function (which reduces the abrupt response of the damper mechanism) adds even more 'size' to the sound. I love it. My only complaint is that I need to buy the optional Nord Triple Pedal to access the pedal noise, half-pedalling, sostenuto and 'soft' functions. In other words, if I were to buy a Stage 2, I would need to add a couple of hundred quiddollars to my budget for the pedal, and I must admit that that would annoy me. The piano sample memory in the Stage 2 is roughly double that of the EX, so the 'Medium sized' Steinway and Yamaha grand pianos (ie. those with fewer string resonance samples) have been retained alongside the 'Large' Bösendorfer. My view of these is unchanged from 2009: they are good enough for many uses, but slightly uneven multisampling means that I might hesitate to use them for solo work. The Yamaha CP80 is also located in the Grand section, and this also suffers from noticeable multisampling. But my biggest gripe with it in the past was that notes were curtailed too quickly when you released the keys. The Long Release facility cures this, and I would now be more than happy to use this sound. Likewise, the upright pianos have made big strides. Those in the EX were very disappointing, but the new ones are a huge improvement. I particularly like the Black Upright, which has been sampled from a piano that I haven't previously encountered, a Petrof 132. The electric pianos are divided into two sets — tines (Mk I, Mk II and MkV Rhodes pianos) and reeds (a single variant of the Wurlitzer EP200A) — and they can be extremely good. I particularly like the Rhodes Mk II 'Shallow Close' version. With tremolo and a touch of drive, played through a slow Leslie, the results are magic. The Clavinets are also very usable, with all four pickup combinations available and the Brilliant, Treble, Medium and Soft options nicely recreated. The sampling isn't perfect, but when they're played through effects and a suitable amp model, the results can be almost indistinguishable from the original. Unfortunately, there are two omissions. The first is the lack of pressure sensitivity. A real Clavinet goes slightly sharp if you lean on a key after playing a note, and the Stage 2 doesn't. The second is much more significant: the omission of the Clavinet's damper. Muted sounds are an important part of the instrument's repertoire, and the absence of a mechanism to imitate these greatly reduces the range of sounds and effects you can obtain. The final set of sounds in this section is derived from two harpsichords; a French instrument with 8' and 4' strings plus a lute stop, and a double-strung Italian instrument. Three variations are pre-loaded, of which the third, the French harpsichord, is superb. With the 8' and 4' choirs plucked and a truly believable release noise, it's pure 1960s' haunted house. Think of the music for The Avengers or Randall & Hopkirk (Deceased) and you're in the right territory. The Stage 2 HA88, despite its huge array of controls and 88-note keyboard is not as large as you might think and measures 1297 x 121 x 334mm. The Stage 2 offers three organ models derived from the Nord C2 — a Hammond B3, a Vox Continental and a Farfisa Compact — so it's a huge shame that its pipe organ sounds have gone AWOL. As is now the norm for Hammond emulations, this one is excellent and, with the new 'Vintage 2' mode selected to provide lots of lovely generator leakage and the improved rotary speaker effect providing some growl, the results can be magic. The initial sound is now much more authentic, the key-click and percussion effects are spot-on, the chorus/vibrato effects are first class, and details such as the compression of the percussion footage and the wrap-around of the 1' drawbar are correctly implemented. All in all, it does its job superbly. I wanted to be a fan of the Vox Continental model on the EX and, to be fair, its underlying sound was good. However, somewhere in its development Clavia discarded the correct footages and mixtures and replaced them with a strange alternative set. Happily, order has now been restored in the ranks (ooo… sorry!) and the 16', 8', 4' and 2' footages are all present and correct, as are the II, III and IV mixtures. As expected, the sound and vibrato are a tad more civilised than my temperamental Vox Super Continental II, but it would be churlish to criticise, because they still reek of cheap (if overly well-behaved) transistors. Comparing the 'Farf' model to my Compact Duo proved interesting because the Nord's sound is not as close as I had expected, representing only a subset of the available sounds and lacking much of the aggressive teenage angst and bark of the original. Nonetheless, with some overdrive to emulate the Farfisa's valve preamp and some high-frequency boost to give it 'edge', you may find yourself playing early Pink Floyd albums whether you had intended to do so or not. So if we overlook the missing sounds, my only serious criticism relates to an error in the voicing. The Nord web site claims that "the Nord models the Compact Duo” but, whereas the uppermost stop on the Compact Duo is a mixture of 2-2/3' and 2', the uppermost stop on the Nord is a single pitch at 2-2/3'. This lacks the 'Brilliant' tab and doesn't work in the same way because the highest component in the sound is a fifth, not an octave. This should be corrected. The improved synth section now boasts a dedicated LFO and an arpeggiator, both of which can be synchronised to a master clock and, with the release of OS 1.30, to MIDI clock. Yes, there are limitations — ADR/ASR envelopes instead of ADSRs, for example — but there's lots that's good, with a large selection of virtual analogue waveforms, including various PWM, double-saw and sync options, 38 2-op and 3-op FM algorithms, and a table of 62 PCM waveforms. You can't sweep through the table (which means that Clavia have been a bit naughty calling it wavetable synthesis), but many of these waveforms are very useful, and when they're filtered, shaped and modulated, all manner of high-quality patches leap out. Note, however, that you'll need to spend some time studying its unconventional architecture if you want to get the best from it. The positive side of this is that you may stumble upon new ways of doing things and new sounds in the process. Back in 2009, I described the Nord Sound Manager and asked, "how long will it be before the EX can utilise Mellotron samples, or even RMI Electrapianos, Hohner Pianets, Solinas and Logan string ensembles?”. Well, we now know, because the synth section in the Stage 2 incorporates 384MB of dedicated flash RAM and is compatible with the complete Nord sample library. This contains Mellotron samples, RMI Electrapianos, Solinas and Logans, together with a wide range of Chamberlin tapes, guitars and basses, harmoniums and organs, vocals, wind, brass, percussion, an interesting range of vintage Korg synths and even a couple of Hohner Pianets! All of these samples, together with Clavia's Sample Editor software, are available on the second DVD supplied with the Stage 2, so you can even edit and map your own samples and multisamples, and then convert them into Stage 2 format for dumping into its internal memory. It's not the most intuitive program I've ever seen, but it turns the Stage 2 into a powerful Sample + Synthesis instrument. This is a massive step forward, and I strongly recommend that you experiment. The results can be impressive. To get the best from the Stage 2, you'll need to get your head around its unconventional architecture and odd programming system. In essence, each Program contains two layers (Slot A and Slot B), and you can place any or all of the three sound-generating sections into these — either across the whole keyboard or into an active split (chosen from Lo, Up and Hi) or in adjacent combinations of these. There are numerous limitations of this structure, particularly the 10 pre-defined split points, but it still allows you to create combinations of, say, piano/strings ensembles, dual-manual organ registrations, dual-voice polysynths, or even six-part piano/organ/synth stacks six layers deep. You can also play Slot B from a dedicated external keyboard, which will appeal to organists. The effects structure is just as limiting because (with the exception of the global effects) only one sound generator at a time can access each effects section. This means that if you want, say, chorus on your synth sound, you can't have chorus or any other effect from the Effect 2 section on any other sound unless you use both Slots. Consequently, you have to plan carefully how you're going to allocate the effects within Programs, and decide to which outputs you're going to send sounds if external treatment is necessary to obtain the results you want. Happily, you can control each of the six instruments in the two Slots using a separate MIDI channel, and the Stage 2 now offers an extensive MIDI CC list. Meanwhile, in the other direction, each Slot offers an 'Extern' section to control an outboard synth or module. But perhaps the most important MIDI improvement over and above the EX is its ability to synchronise the synth's LFO, the arpeggiator and appropriate effects to MIDI clock. You can select a different clock ratio for each parameter, so, for example, the arpeggiator can be running at twice the speed of the LFO, which is itself running at twice the speed of the chorus and at 3/8ths the speed of the delay effect. Setting up Programs in this fashion can yield classy results, tying multiple sounds together into a coherent whole as well as providing all manner of rhythmic effects. Of course, there are many things that haven't changed. One worthy of mention is Morphing, which allows you to move smoothly from one set of parameter values to another, using any combination of the mod wheel, control pedal and aftertouch to do so. Morphing isn't confined entirely to continuous parameters so, for example, it can switch Farfisa tabs on and off, although it can't change the organ model itself. One of my favourite uses is to 'pull out' Hammond drawbars while switching the Leslie effect from slow to fast using aftertouch. You may prefer to make radical changes to synthesized sounds and effects settings but, however you use it, get to know morphing well... it's your friend! Finally, it's also worth noting that the memory structure in the Stage 2 has been extended and improved. For example, the synth sounds are no longer divided into the meaningless Bass, Pad and Synth banks, and are now simply numbered 1 to 300. More importantly, the Program memory has been increased, with four banks of 100 Programs plus five 'Live' locations. However, the factory Programs are stored in no particular order, so I think if I bought a Stage 2 I would create some sensible libraries. At some point during the course of this review, I used the Sound Manager software to delete the existing grand pianos and load the 'Extra Large' Bösendorfer and, in truth, I think that I could play this all day, not just because it sounds great, but because the HA88 keybed makes it a pleasure. Of course, a fully weighted keybed is not ideal for all keyboard instruments — Clavinets and harpsichords, in particular, have a completely different feel — but I was pleased to find that I could use the HA88 for these without problems. Likewise, I found it to be fine for polysynth duties. I could even attempt organ swipes without shredding my fingers although, if this were my prime requirement, I would certainly consider dropping down to the SW73 (semi-weighted keyboard) version. All in all, the Stage 2 is a huge step forward from the Stage EX. It's not cheap, but the combination of excellent acoustic pianos, superb e-pianos and Clavinets, unsurpassed organ emulations, sample replay and a surprisingly flexible polysynth should be a powerful aphrodisiac for players whose response to modern workstations is something along the lines of '$*%$?!?!?'. Of course, it offers far fewer facilities than, say, a Roland Fantom G8 or a Korg Kronos 88 (both of which can do everything that the Nord can) so there's no way that one can justify it in terms of a conventional price/performance ratio. 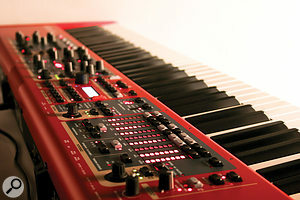 But if you cherish a simpler approach and the price hike is not a problem, the Nord Stage 2 is a very fine instrument. If you require complex multitimbral setups when playing live, or facilities such as sequencing and audio playback, you should be looking at one of the monstrously powerful keyboard workstations now available. But if your needs are less complex, you might also want to consider the Roland RD700NX, Korg SV1 or Kurzweil SP3X (which concentrate primarily on pianos) or the Roland VR700 (which concentrates on organs). Nonetheless, by placing equal emphasis on pianos and organs, and by making the synthesizer section as powerful as it now is, Clavia have ensured that there is probably no other 'stage' keyboard competing directly with the Stage 2. The Stage 2 boasts seven effects processors: rotary speaker, effects 1 and 2, delay, amp/speaker simulation, compression and reverb. Despite the absence of tweakable parameters (there's just a single acceleration/retardation parameter in the Sound menu) the rotary speaker simulation is excellent, and its overdrive purrs beautifully when required. Not just useful for organs, it works just as well on sounds such as 12-string guitars and pianos, so your favourite Beatles songs are never more than a button-press away. The Effect 1 section offers auto-panning, tremolo, a ring modulator, wah and two types of auto-wah. You can only use one effect at a time, and the amount by which you can modify it is limited to just two parameters — rate and depth. The Effect 2 section offers two phasers and two choruses, but one of the EX's flangers has been replaced sby 'Vibe', based on "a desirable foot pedal”. Again, you can only select one at a time and, as you would expect, they lack the noisy whoosh and depth of vintage stomp-boxes. Nonetheless, they're usable. The next two sections are the stereo delay and the amp/speaker simulator. In addition to its three-band EQ and overdrive, the latter of these offers models of a Fender Twin amp/cab, the Wurlitzer EP200's internal speakers, and a Roland Jazz Chorus cabinet. Unfortunately, it responds incorrectly to the signal level presented to its input. To demonstrate this, send a loud Hammond sound to the simulator, select one of the amp/speaker models and turn up the drive. Now reduce the volume of the organ section using its Level control. The sound becomes quieter but the amount of distortion is unaffected, which is wrong. Now return the organ Level to its original value and 'push in' the drawbars. As you do so, the amount of distortion diminishes as it should. This error means that you cannot 'swell' sounds into overdrive and distortion. Finally, there are two global effects. These are a simple compressor and a basic reverb processor with six reverb types. For stage use — which is, after all, the instrument's raison d'être — they are fine. The Stage 2 does not have the range of I/O that you might expect, offering just four unbalanced quarter-inch outputs, whereas a minimum of three stereo pairs (one for each sound generator) plus a 'total' output would have been closer to ideal. Alongside these, there are inputs for a sustain pedal, a control pedal, a single swell pedal (which can be directed to the organ alone or control the global volume) and a pedal to control the speed of the rotary speaker effect. If you pay the extra for the Triple Pedal, this replaces the sustain pedal. MIDI In and MIDI Out are provided, but there's no MIDI Thru although, on a more positive note, the Stage 2 now understands MIDI over USB. Finally, there's a new monitor input that directs the signals from external players to the headphone output (but not the signal outputs) for rehearsal purposes. The Nord is supplied with two DVDs. Alongside all manner of brochures and demos, the first contains Version 5 of Clavia's piano library, plus the Sound Manager software that allows you to organise your piano sounds, samples, synth patches and Programs, and load them into the Stage 2. Complementing this, the second DVD contains Clavia's growing sample library, together with their powerful Sample Editor, which allows you to take your own samples and multisamples, then edit them (if required) and convert them into the Stage 2's dedicated format prior to uploading. Clavia have been very astute in providing these packages free of additional charge because, offering the promise of new piano (-type) instruments in the future, plus the ability to turn the Stage 2 into a powerful, personal sample playback instrument, they dramatically increase its desirability. And, just to ice the cake, installing everything was painless and the software worked perfectly throughout this review. The keyboard itself was shipped with OS 1.26, but during the course of the review, OS 1.30 was released. This offered numerous bug-fixes and improvements, such as rebalancing the output levels of the sound generators, faster morphing, new MIDI CCs, the addition of a global MIDI channel, improved SysEx support and synchronisation of the internal master clock to MIDI clock. I downloaded the OS and upgraded the Stage 2 in little more than five minutes, and Nord's software couldn't have made it any more straightforward. Bravo! The acoustic pianos are excellent, as are many of the electric pianos, clavinets and harpsichords. The organ models and their related effects are superb. The synth section is greatly improved, and the ability to load, replay and further shape samples is a huge step forward. It's built like a tank yet still looks stylish. It's not cheap, and making the triple pedal an expensive extra is rather naughty. Its voicing and effects architecture is restrictive if you need to step beyond basic multitimbral setups. The Stage 2 blows its predecessors away. It's not cheap but, with its excellent new pianos, superb organs, improved synthesizer and its ability to load and play your own samples as well as Nord's existing library, you have to take it very seriously.